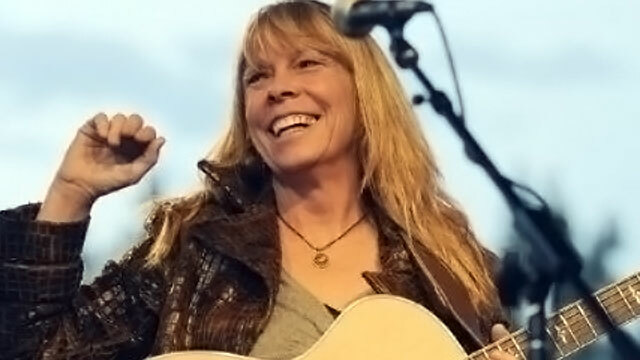 When she sat down to take the WFUV Pop Quiz with John Platt, Rickie Lee Jones talked about what supports her on the road, her wild love for "Wildfire" and her non-fiery personality. Plus, she explained her cooking method of pairing pears and her love of hang gliding. My bra. I can't go onstage without a bra, so I guess that's it. The song about the horse? The Michael Martin Murphey song? Yeah, I like that song. And it makes a lot of money. And I love horses. Who do you wish had recorded one of your songs (dead or alive)? Frank Sinatra. I wish he had recorded "Company." When we wrote it, we wrote it with him in mind. Did you try to get it to him? We did. While making my first album, Mo Ostin and Lenny Waronker flew to Vegas with copies of the record. What song would you sing in the shower but never in public? The first one my mother bought for me was a Beatles record. The first album they got me was The Beatles vs. the Four Seasons. It was a double record and I never listened to the Four Seasons part, but it had all these facts about the Beatles and "Anna" and "Twist and Shout," and "There's a Place," which is just about my favorite Beatles song. If someone finds your iPod and hits shuffle, which song do you hope doesn't come up? I wouldn't want to say that, because I wouldn't want to hurt anyone's feelings. If I like a song, I like it. Like with "Wildfire." It's a beautiful tune, it's not a hip tune, but it's a beautiful song. I wouldn't want to be on someone's guilty pleasure list, so I wouldn't want to say anything's on mine. What's your favorite Dylan song? Oh, how could you have a favorite Bob Dylan song? I really like "It Takes a Lot to Laugh, It Takes a Train to Cry" and then there was this kind of obscure one that I don't know if he ever put out that had this refrain, "Come on, give it to me, I'll keep it with mine." And you don't even need to hear the rest of the song. It was a really pretty one. Fairport Convention recorded that, with Sandy Denny. Very early. And I think it was one of those songs circulating at the time, where the Byrds got some and Peter, Paul and Mary got some. It may be on one of the bootleg ones. It's a pretty one. You should record it some time. I only heard it in the early '80s, somebody had a bootleg of his. I haven't heard it since. What job would you have if you weren't a musician? I would like to be an anthropologist, to be out there in the field digging for bones. Or I would like to be in research in animals. You know what I would like to be? I would like to have a job at the Rand Corporation, just postulating fantastic ideas. No, I think everything is pretty obvious on me. You know, like my music, I make it up as I go. I feel it, I go, "What's going to work with those pears? Almonds go well, what goes with almonds?" And I just follow the path down. But let's see, if my daughter was coming home, I would probably make that twenty cloves in a chicken thing, or a pretty great spaghetti sauce. Probably the spaghetti. What is the biggest misconception that your fans or the media have about you? That I'm an angry and volatile person. It's not that I don't have moments. But I think my early years of being a volatile person kind of led to that legend. And again, it's not that I'm perfect. But I'm not an angry person, I don't like to do battle, and I really like to work things out. I've changed a lot since I was a kid. What wacky thing would you do if you had the time or the guts? I would like to do more hang gliding. I'd like to do that a lot more. I did it once, and you really are flying. It's amazing. See the other artists who've taken the WFUV Pop Quiz.